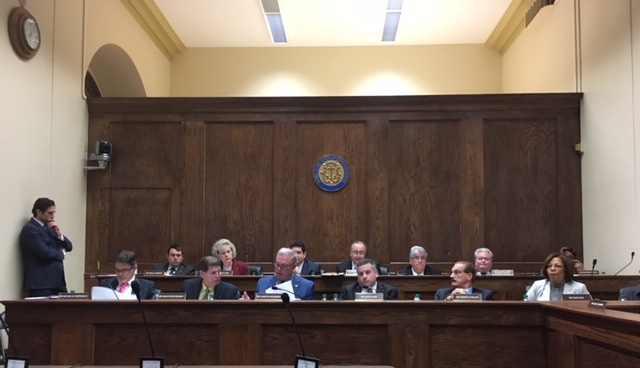 The Rhode Island House Rules Committee approved Thursday a minimum 24-hour waiting period to review significant changes to legislation in House committees. But critics said the Rules Committee failed to go far enough in making more changes to improve the legislative process. “I think there’s a substantial improvement in the SubA process,” said House Minority Leader Blake Filippi (R-New Shoreham), referring to the new one-day delay on considering big changes to bills in House committees. “That has been a Republican initiative for four years. We had put a similar amendment on the floor two years ago that was defeated." Filippi said the Rules Committee should have also made it easier to move bills out of House committees. While House rules allow for a discharge petition, they haven’t been used in years. Critics blame the situation on how signatures must be placed on petitions near where the powerful House speaker is positioned on the rostrum. The Rules Committee approved the new rules governing the House on a 14-to-3 vote, with the three Republican members of the committee voting in opposition. The bill is expected to win approval from the full House next week. John Marion, executive director of the good government group Common Cause of Rhode Island, called the new 24-hour waiting period for significant changes to bills in committee an important change for the better. Marion said the revised rules also include more details on a new sexual harassment policy. “But there is still not very much detail in that,” and it needs further work, he said. Marion also lamented how the 24-hour waiting period doesn't apply to the House budget, the most detailed and complex matter taken up in the chamber each year. Rules Committee Chairman Arthur Corvese (D-North Providence) said he was comfortable with having the Rules Committee vote on the revised rules, which were not publicly unveiled prior to the committee meeting. “I believe that this is something that had to be done early in the session for the orderly conduct of business,” he said. Alex Kithis of the citizens group Rhode Islanders for Reform pointed to the exceptions in calling the new 24-hour waiting period meaningless. But Corvese dismissed the possibility that legislative chairs would try to sneak legislation through committees under one of the exceptions. Three members of the ‘Reform Caucus’ called the new 24-hour waiting period a partial victory. Rep. Kathy Fogarty (D-South Kingstown) acknowledged for voting for the House rules last year, but said concerns grew as the session continued. A major irritant was how a pay equity bill introduced by Rep. Susan Donovan of Bristol was reshaped and returned to the House floor without her advance knowledge.